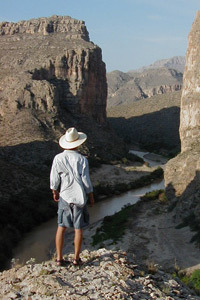 NPS Photo\Big Bend National Park. The Rio Grande cuts through the Dead Horse Mountains at Boquillas Canyon in Big Bend National Park. Geologists find faults in the mountains dating to the Laramide Orogeny – the mountain-building event that shaped the Rocky Mountain West. Eighty million years ago, North America teemed with the life of the Cretaceous Period. Dinosaurs roamed the land. Giant marine lizards prowled the waters, and flying reptiles hunted from the skies. But there was activity of a slower, quieter form as well. From modern Canada to Northern Mexico, parts of the continent’s ancient foundation were being thrust from the depths toward the surface. Western North America was squeezed and broken. This was an “orogeny,”or mountain-building event. Named for Wyoming’s Laramie Mountains, the Laramide Orogeny is a defining geological chapter. It was a 40-million-year “event,” and it affected West Texas. “Even continents are impermanent,” the poet Gary Snyder wrote in 1974. Snyder is a student of Buddhism, and the line reflects the Buddhist emphasis on impermanence and change. But Snyder might also have been responding to a new scientific theory, which had revolutionized the study of our planet. The theory of plate tectonics was defined in the mid-60s. The shell of the planet is broken into plates, the theory says. These plates drift or ride on a deeper, less viscous layer of the Earth. Over tens of millions of years, the plates collide and fuse, buckle and overlap. Plate-tectonic theory has helped geologists account for the landscapes of our planet. And it’s filled in the story of the dramatic landscapes of the American West. At the center of that story is a collision – between North America and an ancient oceanic plate, called the Farallon. Jesse Kelsch is a geology professor at Sul Ross State University in Alpine. The violent encounter began 165 million years ago. Off the west coast – present-day Utah – two oceanic plates were diverging. The Pacific Plate was heading west, while the Farallon Plate rode northeast, into North America. Mountains often form at the edge of plates. Think of the Himalayas – which are rising as the Indian subcontinent collides with Asia. But as the Farallon Plate worked its way beneath the continent, the effects extended inland. Western North America was squished and thickened. In places, parts of the continent’s ancient core were raised. These “basement” rocks – formed when single-celled creatures were the sum of life – are exposed today in parts of the Rocky Mountains. The Trans-Pecos, too, was subject to the tremendous compressive force. Some of the clearest evidence is found in the Dead Horse Mountains, in Big Bend National Park, Kelsch said. In the mountains’ limestone rocks, geologists find a system of faults, dating to the Laramide Orogeny. Though its effects were powerful, the Laramide did not produce the Trans-Pecos landscape we see today. By about 40 million years ago, the Farallon had completely subducted. North America moved over the ridge that had divided the Pacific and Farallon plates. The continent began to stretch, extending west with the Pacific Plate. The stretching has torn and broken the West – shaping the mountains and basins of the contemporary Trans-Pecos. Recent discoveries reinforce this tectonic narrative. New technology enables geologists to generate three-dimensional images of the interior Earth. Beneath the American West, they find a “slab graveyard” – chunks of the subducted Farallon Plate, 2,000 miles below the surface. It’s a maxim attributed to the ancient Greek philosopher Heraclitus: “Nothing endures but change.” It applies even to the continent on which we live.